﻿ Spain - Walking the Camino Frances - St-Jean PP to Logrono. Spain - Walking the Camino Frances - St-Jean PP to Logrono. 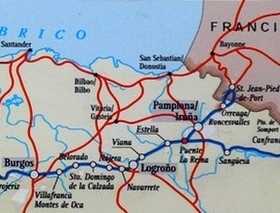 The most famous route to Santiago de Compostela is undoubtedly the French Route or Camino Frances simply called The Camino, which crosses the Pyrenees from France into Spain. The route is brimming with history, legends and art, and boasts a wealth of landscapes and natural settings as diverse as they are unforgettable. This 8 day section from St jean Pied de Port leads you to the start of the Camino. It includes hotels, meals, luggage transfer, one guide book, maps, English speaking email or phone assistance. From the Medieval fortified city of St Jean Pied de Port in French Basque Country and capital of Low Navarra, to Logrono, capital of La Rioja, this program is a discovery of Navarra. The first walking stage is tough as it crosses North to South the Pyrenees by Roncesvalles Pass, then the descent down towards Pamplona is breathtaking, both soft and steep. Wheatfields, olive trees and fruit trees orchards slowly change into vineyards as approaching Logrono. This program is an immersion into Spanish atmosphere and from Puente La Reina where the historic Camino Frances starts and also where all the routes converge, you will certainly meet other pilgrims and learn History thanks to the rich heritage of churches, monasteries, palaces. Saint-Jean-Pied-de-Port. This fortified medieval city is the last stage in France before reaching Spain and Roncevaux Pass across the Pyrenees. Hotel in BB. Saint-Jean-Pied-de-Port - Roncevaux- 26 km (16 miles) - 6h30 walk. Ascent : 1400 m. This stage is considered as a mythical hike across the Pyrenees. A very tough ascent, which can be shortened with a shuttle. Roncevaux - Zubiri - 22 km (13.6 km) - 5h30 walk. 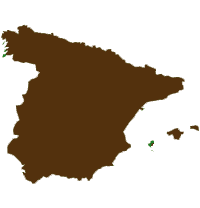 Zubiri - Pamplona - 23 km (14.3 miles) - 5h45 walk. Pamplona - Puente La Reina - 25 km (15.5 miles) - 6h15 walk. Puente La Reina - Estella - 20 km (12.4 miles) - 5 hour walk. Estella - Los Arcos - 22 km (13.6 miles)- 5h30 walk. Los Arcos - Logrono - 28 km (17.4 miles)- 7 hour walk. You can add a night in Logrono and combine that program with another starting from Logrono and ending in Burgos. 780 € per person in single room. 650 € per person in single room. Carefully selected 2 and 3 star hotels in the cities and Residenciales or Guest Houses in Rural areas. Dinners and breakfasts are in your hotel and can be "table d'hotes" with other guests. English speaking Phone assistance during your trip. The trip to the start of the trip and from its end. The dinners in Pamplona and Logrono. Drinks. Travel insurance. Everything else that is not listed under "Price includes". Logrono : Train to Hendaye and Biarritz. Puente La Reina, meeting point of the pilgrims. Pamplona, Estella, the jewel of the Camino !